In a situation like this it is best to see a medical practitioner. We perform tattoo removal in our medical office and therefore have a doctor to see any issues which occur. 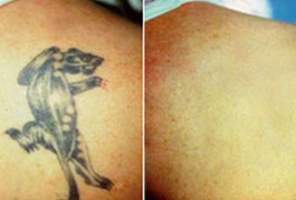 If you had this done at a tattoo removal clinic then you should see your own doctor. They usually have an absent medical director. Without seeing you and knowing/seeing your tattoo, colors etc it isn't possible to guess what is occurring ?While waiting to see someone, try elevating your leg, keep the area clean, don't break blisters if possible (they are technically a sterile dressing) and keep the area moist with a high quality cream such as calendula or Dermaka. It is highly unusaly to have so much swelling. You also did not mention the location of the tattoo, if it is full circumference around the calf etc.